There's been a fair bit of chat about East Coast IPAs in the deeper reaches of the local beer scene recently. These hazy (or often well beyond hazy), highly fruity IPAs have been the cause of some controversy, best articulated locally in the Ale of a Time article we linked to in last Friday's newsletter. But, controversy aside, of most interest to Aussie beer and hop fanciers will be that a few brewers are starting to explore the style here (although not using flour yet, as far as we're aware). Among them is the duo behind Hop Nation, the former winemaker-gypsy brewers who now have their own brewery home in Footscray. 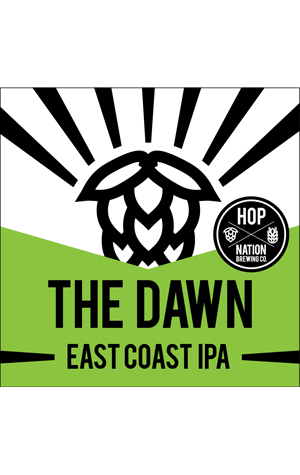 Their East Coast IPA is The Dawn and, after a couple of weeks on tap at their venue, it's now been sent out into the world. Designed as a showcase for punchy New World hops Citra and Nelson Sauvin, the brewers reckon it "boasts BIG fruit" of the pineapple, mango and light citrus (grapefruit and orange, to be specific). They also tell us The Dawn has a "slight piney resin character" balancing all the fruit in a beer that "pours slightly hazy in the glass with a bright lemon colour".